So this week has been a bit of a rough one for me. I got a horrible stomach flu, pulled a muscle in my back and had a 3 day brutal migraine. Needless to say I needed a pick-me up, and thankfully Eddie the Eagle was just such a film! It fits all the standard tropes of an underdog sports movie but as someone who loves those kind of movies I loved it!! 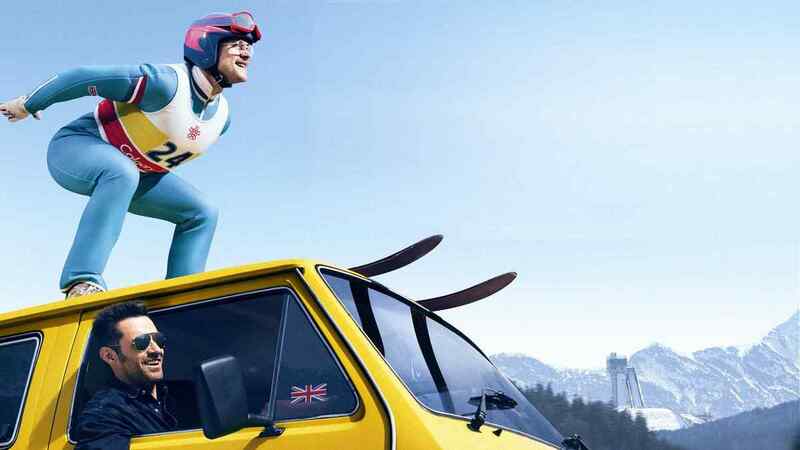 Eddie the Eagle tells the true story of Eddie Edwards who in 1988 charmed the Olympics by finishing last at the ski jump. How’s that possible, you ask? Well, it’s because the Olympics is not always about who gets those medals but who ‘takes part’ and does their best. As a child Eddie had to be in the hospital for a year because of his bad legs, and he used the dream of becoming an Olympian to motivate him to recover. Unfortunately he didn’t have the physical prowess or natural abilities of most Olympians but he eventually found skiing and almost made the British downhill team. When that didn’t work out he decided to learn how to ski jump. There was no British team and he could qualify with a modest jump. He basically teaches himself until he meets Bronson Perry (Hugh Jackman) who is an American jumper who never reached his full potential. Through sheer determination Eddie convinces Bronson to be his coach and he makes his way to the Olympics. Amazingly enough he completes his jump in the 70 meters and then in the 90 meters- a jump he had never attempted until that day in the Olympics! Isn’t that nuts! He did a major ski jump for the first time in the Olympics! 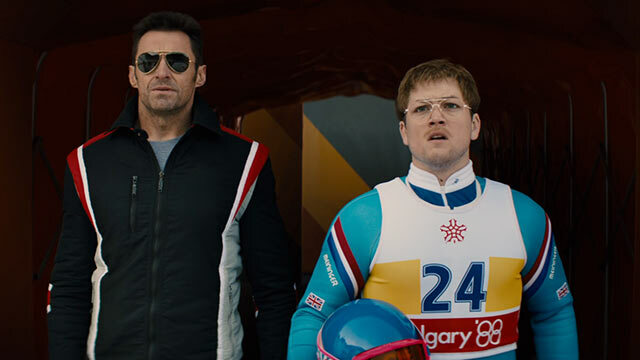 Jackman and Taron Egerton, who plays Eddie, have great chemistry and they sell the admittedly schmaltzy dialogue. Director Dexter Fletcher keeps things pretty tightly paced and the film has a lot of sweetness and humor. Is it new or original? Of course it’s not. It’s basically the same movie we’ve seen in Rudy, Cool Runnings, and even Miracle. As I love all 3 of those movies that is no problem for me! It doesn’t transcend the genre like the boxing film Warrior or even Creed did but I didn’t need it to. I just wanted something that would make me smile and feel good, and that’s what Eddie the Eagle did. It doesn’t hurt that I am a huge Olympics junkie and have watched every year since I was a little girl as well! The Olympics are just awesome. It’s so random we’ve had 2 Olympics movies in 2 weeks. That’s actually really rare. For all their drama there aren’t that many films set in the Olympics- Miracle, Chariots of Fire, Cool Runnings, Cutting Edge. Not that many. 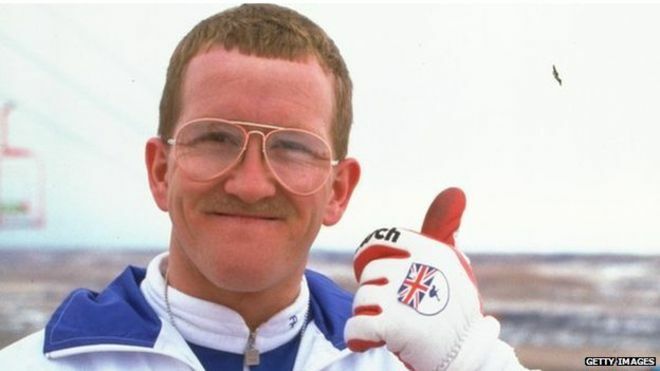 I do think Eddie the Eagle is tighter and better done than Race; although I enjoyed both films. I would say I don’t think it is quite as good as last year’s McFarland USA, which to me took this formula and told a compelling story about lower income America. That movie was more emotional for me; whereas, this was just a good time at the movies. If it’s not your cup of tea I totally get it but sometimes I like going to the movies and being inspired by a sports movie. The performances are winning. The ski jumping is well portrayed and I found myself cheering for Eddie and his dogged optimism. And glad you enjoyed this film, but I really have no plans on watching this one. Just not my cup of tea, as you said. I mean I did like them, but I really only watched them because they were Disney films, especially McFarland. Hence, I feel no sense of need to see this Eddie the Eagle film. Ah yes, we Brits love a tryer, mostly because it makes us feel better about struggling to actually win things. (Don’t get me started on our national soccer team.) Last Winter Olympics, we got 4 medals and considered that a great result! Rather strange how this film has been released in the US before the UK. That’s so funny. Poor Brits! I would have thought your national soccer team was good. Had you heard of Eddie the Eagle before this movie? I think you will really like it. It is really strange it got US release first. Why is it some movies like Zootopia get released there first and others dont? Yes, I had heard of Eddie, and no, I’m afraid I can’t explain these differing movie release dates. There’s a sizeable gap between what is expected of the English soccer/football team and how they actually perform in major tournaments, though this has narrowed in recent years as expectations have fallen. For all our nation’s love of football, we only won the World Cup once (when we hosted it in 1966) and only made the top four once more, in 1990. Last World Cup, we didn’t even get past the first round! Sad! I always figured England was good at soccer with David Backham and such. Wanted to see it Friday but went with two other films instead. Hope to catch up with it next week. Pingback: Florence Foster Jenkins Review – Reviewing All 54 Disney Animated Films And More! Pingback: Overlooked Films of 2016 – Reviewing All 56 Disney Animated Films And More!